Wow! This prints the “load:” and “sleep:” status lines, showing information about the process. This works with other commands too, like dd(1). The “load:” line comes from the kernel, and extra lines are up to the process. As a performance engineer, I find it pretty interesting. This magic works via detection of a STATUS control character, Control-T, by the kernel tty driver, which then prints the load line via tty_info() on FreeBSD or ttyinfo_locked() on Mac OS X. It also sends a SIGINFO to the process, so it can run its own routine. See STATUS in the termios(4) man page. FreeBSD has the most detailed “load:” line, beginning with the 1 minute load average, then “cmd:” and the process name and PID of the most interesting process to report on (as decided by proc_compare(), based on recentness and CPU usage), state of that process, the real, user, and system times, percent CPU, and finally its RSS (resident set size). Mac OS X has similar details, ending with user and sys time. This sleep doesn’t do the “sleep:” line. I wish this was in other kernels as well, like illumos and Linux. While they may not support Control-T and “load:”, their processes may still have a status signal. For example, GNU dd(1) prints status on a SIGUSR1, which you can send using kill(1) from another terminal. And in another terminal, you can dig the “load:” line details out using other commands. Control-T just makes it easier. Where did Control-T come from? In a Mac OS X forum, a 2012 post makes the comment: “Not sure if this was available before 10.7″ (2011). I don’t know if it’s new in Mac OS X, but it certainly isn’t new. Control-C was familiar, but Control-T? Having mostly used Solaris- and Linux-based systems, I wasn’t familiar with Control-T. Could it still be around? Feeling a little foolish, I opened a terminal on my macbook and typed Control-T. Nothing. Then I tried while a command was running, and was stunned to see the status line printed. Have another early example? Post it in a comment! ctrl-t was always in (Open)VMS, and as VMS was a successor of sorts to TOPS I wouldn’t be surprised if it was in TOPS to begin with. 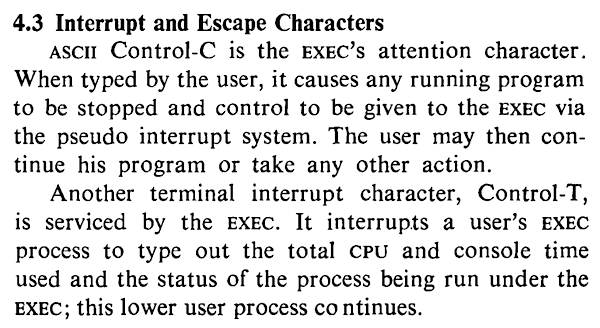 A few machines at MIT were running hacks that implemented it in BSD in the ’84+ timeframe – useful on a timesharing system to figure out if it’s just your job looping or if the machine is just overloaded. Multics definitely didn’t have it – it tried to offload as much character-at-a-time processing onto front-end I/O processors so the main CPU wouldn’t need to take an interrupt until it had a full command line. yet; should require some code additions to tty driver.